Having spent a couple of weeks in the far east I now feel obliged to share my experiences with the highly esteemed high level bits reader. Before the trip I blogged about planning the trip so I won’t bother you with that again. Both Japan and Korea are very different from Sweden and western europe. In many ways they are more modern but in other ways they stick to tradition. We tried to mix culture and history with the modern way of life and thus we time travelled through both countries starting with something old like the amazing temples of Kyoto and ending in the capitals. Both of which has this mind blowing fusion of old traditionalism and a new modern (or is it postmodern or even postpostmodern these days?) lifestyle. Lets look a bit closer on what we experienced in Japan. I realized after a while writing this piece that it would benefit from being split up in parts. This first part will be dedicated to the former capitals of Japan - Kyoto and Nara. 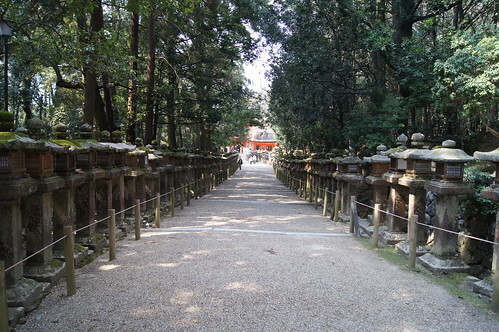 The buddhist and shintoist temples of Kyoto and Nara is really breathtaking. 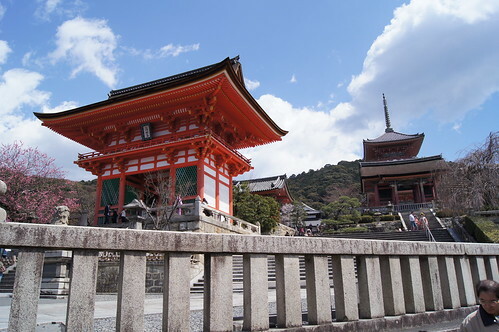 We spent a day visiting temples in Kyoto and made a day trip to Nara to do the same. 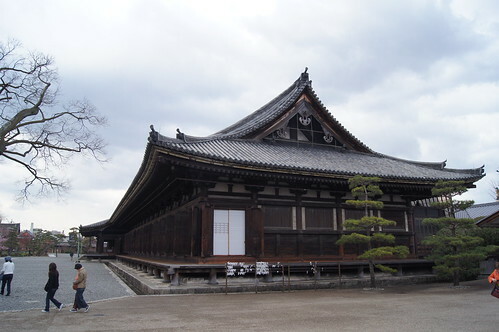 Kyoto is the old capital and was home to Japans emperor until as late as 1868. True power had by then shifted to Tokyo (then named Edo) with the rise of the shogunate in the 17th century. With the Meiji restoration the emperor got some real power back and Japan opened up to foreigners after a couple of centuries of near hermetic enclosement. (Also interesting that the romanizations of these two capitals are anagrams.) Kyoto is now a modern city and not much of its glorious past is visible in the city center although there certainly is a higher penetration of shrines than in Tokyo. The most interesting temples are located to the east on a hillside and offers nice views of the city. We started our temple walk at Sanjūsangen-dō that had an amazing 1000 statues guarding the thousand armed Kannon. You are not allowed to take any pictures inside so here is one from the outside. To Kiyomizu-dera we hiked uphill through a cemetery - a great way to approach a shrine. This one was really sitting on the edge of the hill overlooking the cemetery and the distant city. 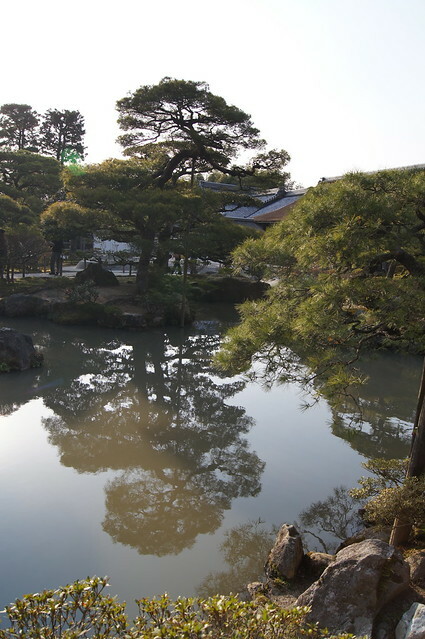 The third temple worthy of mention is Ginkaku-ji where the gardens are breathtaking and zen calmness easily settles on any visitor. 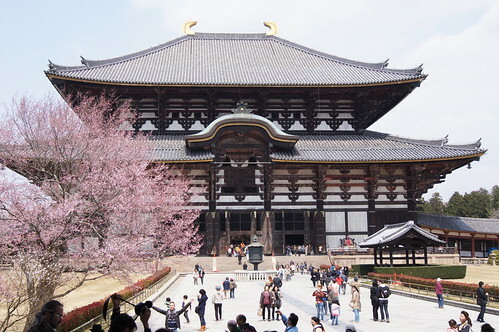 Nara was the capital for a brief period in the 8th century after a period where each new emperor had to live in a new place but before an emperor decided that Kyoto was the place for imperial palaces. This has left Nara somewhat less touched by developments as the ones seen in Kyoto where things have changed in many ways during its many years as the emperors home. In Nara we first visited the huge Daibutsu-den - the worlds biggest wooden building where a huge buddha statue with a couple of guardian statues are the main attraction. We then climbed up to Nigatsu-dō, a nice temple with some views over the city and the big temple below. The third and last temple of our short stay in Nara, , was maybe not that interesting in itself but for the huge amounts of stone lanterns that were present on all roads leading to it. On one approach road there were double rows of 2 metre high lanterns on both sides. It would be magical to return an evening when they are all lit. Finally some words about the mighty peoples lodgings. We visited the imperial grounds in both Kyoto and Tokyo the latter of course still being used by the current emperor. We also visited Tokugawas fortresses in both Kyoto and Tokyo. In Tokyo it is the same site as the imperial grounds - the emperor simply moved in here when taking charge during the meiji restoration. 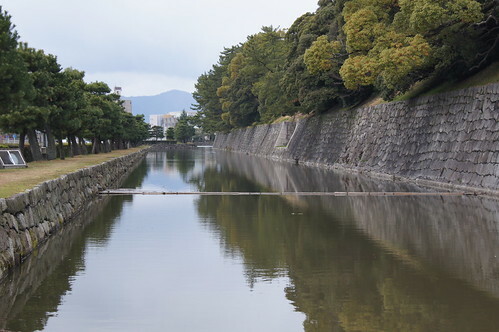 In Kyoto it is a site in itself that was barely used by the shogun and has been more or less unused since then. Both have huge stone walls with the accompanying moat and must have been hard to penetrate. Both Kyoto and Nara is really worth the visit and we could easily have spent more time in both cities. Next part in this travel reports series will probably be about food. Not a single meal was of poor quality or boring so look forward to an interesting post. More images at flickr, one huge set with 1000+ photos and one best-of with 60+ photos. I do trust all of the ideas you've introduced to your post. They're really convincing and will certainly work. Still, the posts are very short for starters. May you please lengthen them a bit from subsequent time? Thank you for the post.